You are successfully logged in and the classroom is open! Enjoy! Vous êtes bien connecté et l'atelier est ouvert! Amusez-vous bien! WELCOME TO Layers of Light! This page is your starting place to access all the course contents, guest interviews, resources and bonuses. Enjoy! In this lesson we will explore our relationship with the light around us and in us. We will create a Soulboard to connect with our inner guiding light and inspire us all along this journey. Contrast is an essential part of art, and life. In this lesson we will gently make friends with the shadows to allow our light to shine brighter. We will tame the blank canvas and let intuition take over with a fun 2 minutes collage warm-up! And we will create peaceful and moody paintings with collage, paint, ink and black & white images. This lesson is all about catching light with texture. We will go on a scavenger hunt for the textures that give our life its unique feel. We will create a mini collage series with encaustic wax on plaster gauze substrates and weave found words throughout the pieces. We stand under the sky and walk on the horizon, on the threshold of past and future, grounded in the present moment. Where does your light guide you?... 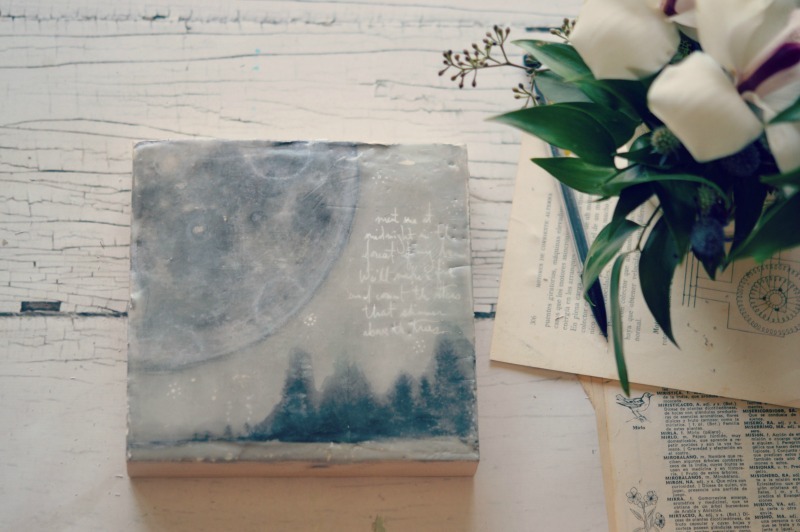 We will create a dreamy landscape painting with gorgeous layers of paper, wax and vintage lace. We will explore our personal symbols and incorporate them in a series of small, deeply layered and light-filled paintings. We will choose a personal theme and work with a fun grid composition. And I will teach you how to build up misty, translucent layers with my favorite faux-encaustic technique! This final lesson is all about embracing our truth, expressing the beauty of who we are and honoring our journey, all in a joyful and playful way! 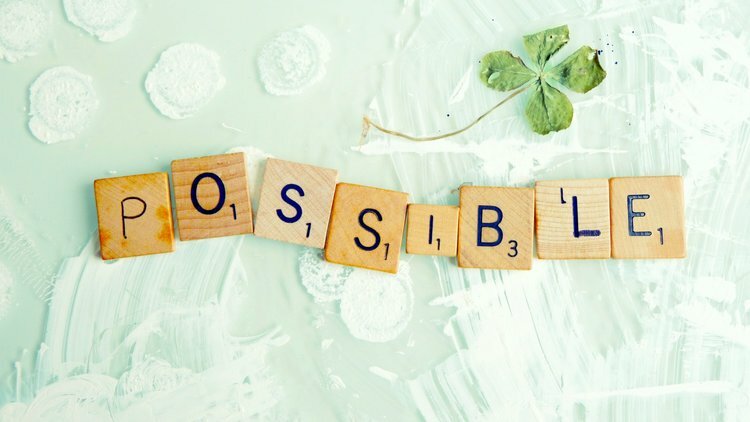 When we dare to dream and cultivate a childlike sense of wonder, when we connect to our inner light and let it guide us, when we open up to the deep magic of our journey, anything becomes possible! You've reach the "end" of this class, but my hope is that it is only the beginning of a beautiful journey together! Thank you so much for the privilege of being your guide and seeing you shine brighter and brighter, I am so proud of you! I feel so grateful, and so inspired by you all... I couldn't be happier to see how everyone is taking exactly what they need from the processes I am sharing, how you are making it all your own, trusting your intuition, tuning in to your own rhythm... MAKING ART. My hope is that this experience opens new doors for you and your creative soul, that it brings you closer to your own true light so that you can express it and share it with the world more and more: because when you do, when you shine your truth with courage and joy, you become a Light Bearer, allowing others to shine too! And that is so much needed in our world. Of course you can revisit the contents of the course as often as you like, as well as the bonus lessons, and I would love for you to join me again in another class! Little Book of Whispers is the perfect complement to Layers of Light (in fact I created it from all the beautiful left-overs from the classe's projects!) and I'm also preparing more lovely courses just for you! I will keep you posted by e-mail and in our Facebook group. There will also be some new "student spotlight" guest posts on my blog because I believe with all my heart that taking this next step and showing your work with the world is super important. 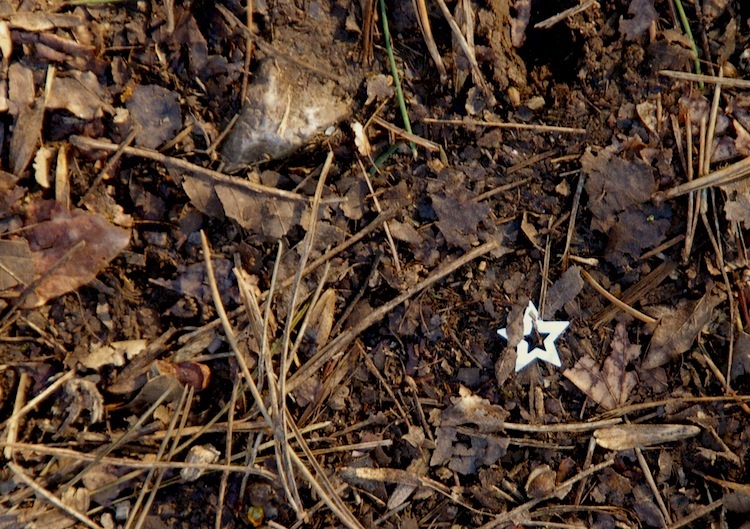 You've got sparkly fairy dust at your finger tips: please keep using it and keep shining! I hope you've enjoyed the class! Please leave a testimonial for me below, thank you! Laly: In art as in life, I believe that contrast is a key ingredient. You recently wrote an article about how important it is to embrace both our inner light and the darker, not-so-shiny parts of ourselves. Can you tell us more about this? Meghan: I'd love to! For the past little while I have felt really overwhelmed with the current 'look-for-the-light' mentality that seems to have taken over social media. There is much emphasis being placed on the light, the bright, the high-vibration as if they are the only place where there is value. As you as an artist know, too much light can be overwhelming. Too much light gives us sunburn and dazzled eyes and can burn us out. Not only that but by placing so much value on the light, we are taking away from all of the lessons that are there for us in the darkness. And if you look at nature, the darkness is half of the story. In nature there is light and there is dark. There is masculine and there is feminine. There is expansion and there is contraction. A tree, no matter whether it grows in the middle of a field or in the depth of the forest has just as much of its energy growing into the darkness as it has reaching for the light. Without one, the other would not survive. For me it feels critical that we begin to place value on the darkness again because until we do, we will see any of our trips into our own darkness as cause for guilt or shame or self-loathing, instead of important steps in our growth. Despite what the experts say, I don't believe that life is about finding balance. Nature is never really in balance. It's actually always involved in the movement between states. I believe that life is about learning how to dance with reality - all of it - and by doing that, I believe that we will know true light when we see it. Laly: To me, art is magic: it connects us to the most mysterious parts of ourselves, our light, our truth, our soul. It allows us to see the world in a different light, with new eyes. It transforms us. I know that magic is a key element in your life: how does it affect your creative journey, your everyday life? Meghan: Magic is the key element in my life! It's everything. To me, Magic is what I call the moments when I connect to the Divine; to the Universe, to God, to Flow, to the Angels, to whatever your word for the big and magical Mystery might be. I've said before that Magic is the tingle. It's wonder. It's enchantment. Magic is delight, it's help, wink, it's the unexplainable, the miracle, and the holy. Magic, for me, is in the simple belief that there is more, and that I am a part of it. I now realize that my creative journey and my life are not different things. By making the decision that I am a part of a loving, playful, and most of all mysterious universe, I put myself right in the middle of a great adventure. My practice, then, is to live/ create/ interact/ dream from that place as much as possible, with the eventual goal being moving from there all of the time. It's been hard, because I always want to be in control of the universe! But letting go of any belief in control and choosing to play instead has been life changing. Laly: Do you have a favorite kind of light? Maybe a favorite season or favorite hour of the day when light resonates with you the most? What does it tell you about yourself? In what ways does it echo your own inner light? Meghan: I have two answers to your question! My favourite time of day is the not-quite-light times; the between times. I love the few moments just after twilight, before it is truly dark, and the few moments just before sunrise when it's not totally dark anymore. I delight in the energy of those moments. Living in the jungle, you soon discover that there are no quiet moments - but the closest it ever gets is in those between times. And my favourite light by far is firelight. 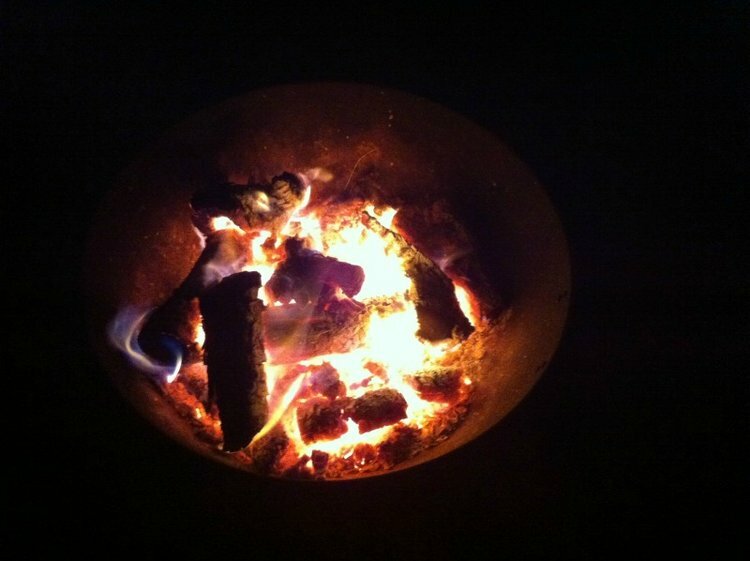 When I visualize a 'happy place' it is nearly always a campfire. In a space where I can't have a fire, I light candles whenever I can. Fire and candlelight soften the energy of the humans who surround them. Where there is fire or candlelight, people gather. Stories are told. Breath is held. People stare into the flames and get lost in thought. The space feels sacred and holy. Where there is fire or candlelight, people gather. Stories are told. Breath is held. So I see from writing this that the firelight and candlelight and the between times that I mentioned all share the same quality: that feeling of magic and possibility and wonder. I like to think that my own inner light helps me and the people I interact with to find those moments of magic in our own lives. To live in those spaces helps us to soften the harsh brightness of a disconnected life and draws us towards connection; towards the Mystery. AND FOR ME, THAT IS EVERYTHING. 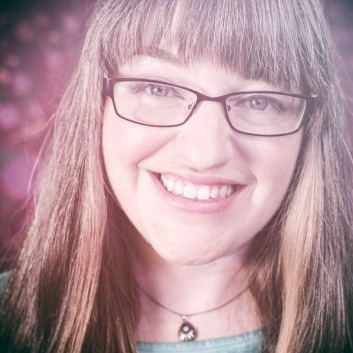 Meghan Genge is a writer, a storyteller, and a finder of magic. She is also the author of the inspirational novel, Unfurl. In 2015, Meghan and her husband sold or gave away nearly everything and moved from the UK to the southern coast of Costa Rica. They are now creating a sacred art and creativity space in the jungle. When Sarah and I met in an online class a few years ago, I was instantly drawn to the unique quality of her art, and above all to her beautiful soul. She captures light and understands contrast like no-one else I know. 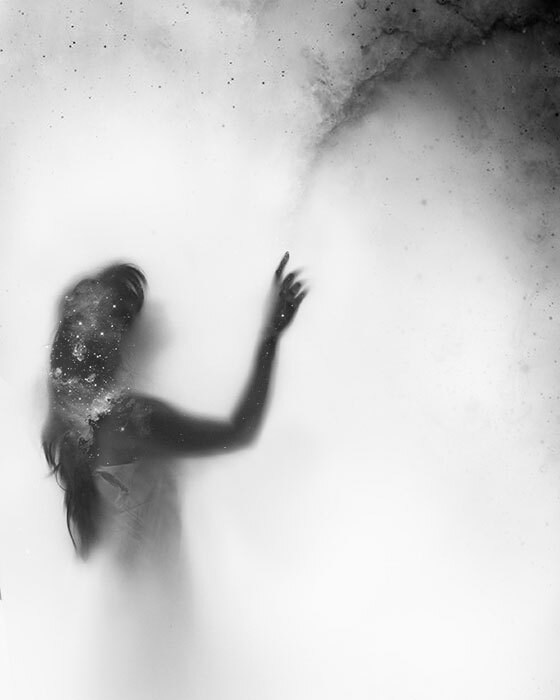 She creates images that vibrate with strength and vulnerability, lightness and earthiness, darkness and ethereal light. I am thrilled and grateful that she accepted to share her unique voice with us. Laly: As a photographer, light is your primary "raw material". 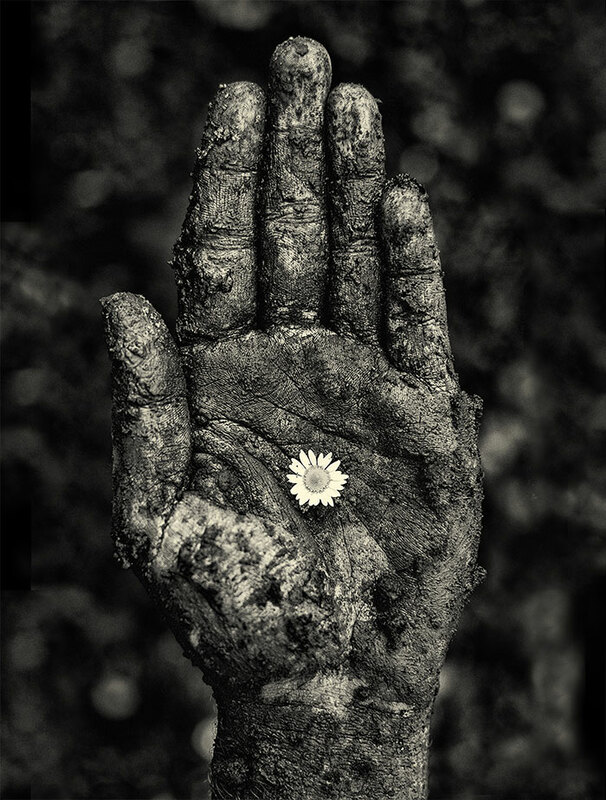 And you work a lot in black and white, which emphasizes light even more: how important is it to your work? How do you work with it? Sarah: I am a true lover of light. The ability this element has to completely change the emotion of a photograph is something that has always fascinated me. The feelings you can create when light plays off of, shines through, or reflects from all number of surfaces gives a whole other layer of endless curiosity to it. It’s one of the most important elements to telling stories in photos, too. Light is where the magic is. More important than all the fancy equipment you can buy, if you know how to wield light to create your stories, your images are going to have something special. My “Still, Life” series was done entirely with natural, outdoor light, either at sunset, sunrise, or on overcast days, as I always prefer the softer light. I don’t use strobes or any other supplemental lighting, for two reasons: I'm slightly scared of it (don't tell!) and I'm lazy! I suppose I just don't like dealing with a lot of equipment. For me, it gets in the way of the emotion of the moment. Despite not having control over my light source, I’m still very deliberate about how I use light in my shoots. I learned a lot the year I worked on the “Still, Life” series. This project – doing one self portrait shoot each week for a year – helped me to understand how to use light by moving the subject and adding various props, instead of altering the light source itself. It’s a wonderful process, playing with light! “Let Go” is a good example of adding props to have a different sort of interplay with light. It was done with a simple, ten dollar fabric shower curtain. Strung up under an open, covered shelter outdoors, the curtain was back-lit softly by indirect light in the late afternoon. Since the sun didn’t hit the curtain directly, it created this soft, eerie effect. This was purely an experiment, something I’d read about in a photo magazine and decided to try. 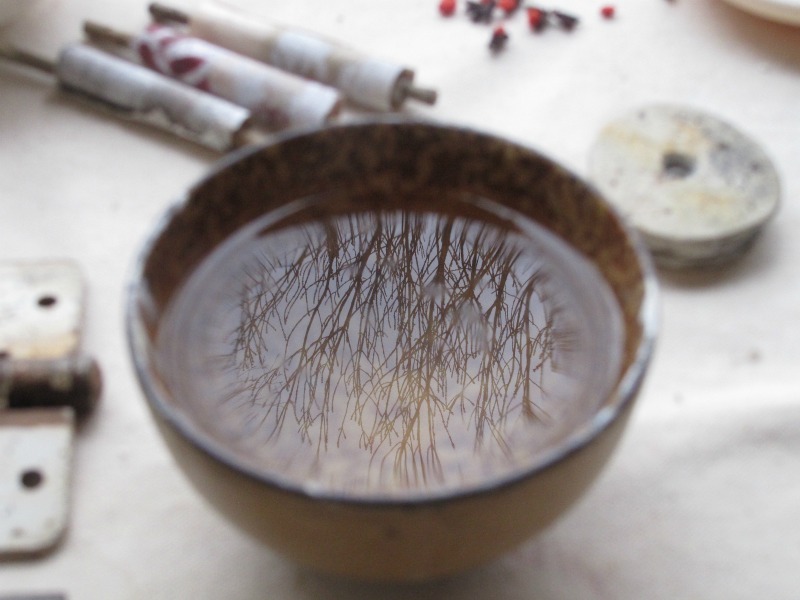 The results were so ethereal, and for me, they spoke to the ideas about the fog in our minds, the unknowns of grief, and spiritual connections. I loved the feel and ideas it stirred in me so much, I spent several weeks using the shower curtain to create with! Laly: In your "Still, Life" series, you express a whole range of emotions and feelings through a whole range of light qualities, from transluscent and glowy, misty, to raw and gritty. How do you use light to express your truth? Sarah: Light is very important to my story. I use metaphors of light and darkness a great deal in sharing the memories and experiences of my past adversities. These metaphors evoke certain feelings in us all, tying to the age-old ideas we all have about the meaning of light and darkness. Climbing out of the pit, falling into darkness, walking into the light, the power of hope, all of these stories need the element of light to exist. Whether it’s through use of literal lighting or through light and dark aspects of the image's composition, it’s a crucial part of how I express my inner world. “The Voyager” is a great example of the light taking the lead. I was out on the edge of a treeline to capture a different shot entirely that day. As I was walking around with the light low in the sky, I noticed how the dry, dusty earth caught the rays of light when I kicked it up. I was instantly fixated on this. As the sun finally set, I was on my knees in the dirt, tossing dust high above my head and all around me, and trying out different poses to go with it. What I ended up with that day was a shot that had been completely unplanned, but entirely relating to the personal journey I was on in my life… about to move across country, just on the edge of adventuring out into the new. The light is what created the magic, and lead me to the image. Sometimes, that’s how it works. Sarah: I'm a sucker for soft light. In autumn and winter, when the world is dormant, is probably my favorite time to shoot because it's often more overcast and I can shoot in the middle of they day even! The magic of dusk or just before sunrise is almost always the time of day I gravitate to though. There is something about shooting on the edges of the day. You have very little time until you lose your ideal light… so you’re up against something, which I like a lot. There’s a metaphor there too... of endings and beginnings, life and death, new phases and change. Perhaps because of my own lifelong experience with grief and loss, being on the edges of things seems to connect well with me. It’s an unusual light, just like my own past has been. It fuels something in me. Sarah Treanor is all about encouraging stories of the human spirit. Her passion to help others become more in touch with their own creative power is shared through her artwork, writing, and teaching from her Northeast Ohio home and studio. In her e-course called Meaningful Making, she is guiding students through creative practices with their grief. 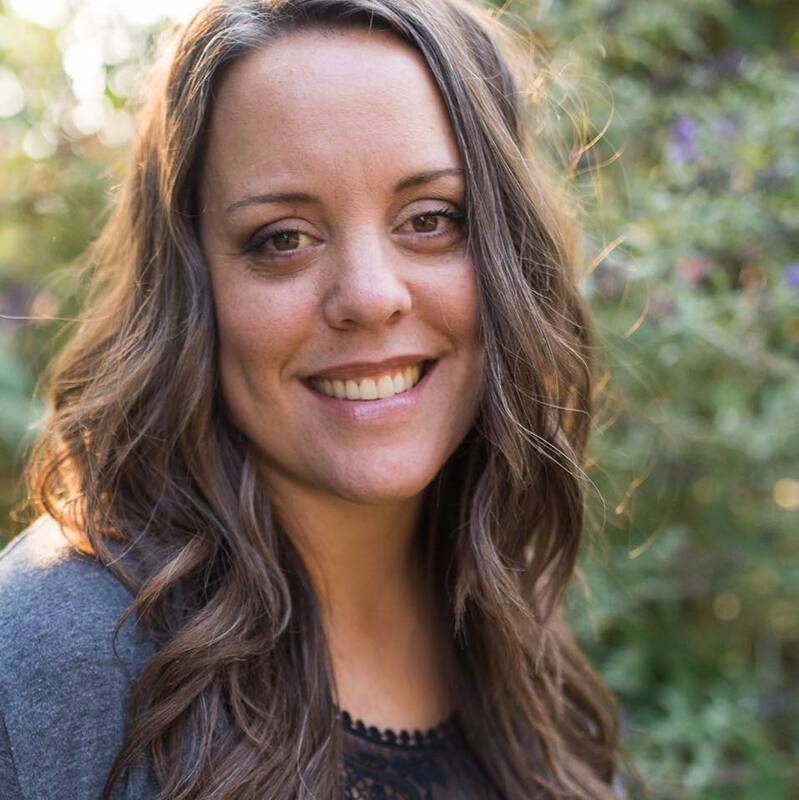 She is the Sunday featured writer for Widow’s Voice, a blog written by seven widowed people telling their experience of living on, and writes regularly on her blog about creativity and adversity. If you’d like to get in touch with her or see more from the “Still, Life” series, you can visit her website or follow her on Facebook! Above my desk I have a painting by Petra that says "Relax and Allow"... Every time I look at it, I feel like I breathe a little more calmly and deeply. That's the magic of Petra's art... Petra Hrziwnatzki is a mixed media artist, mother, teacher and soulful inspirer, on a mission to "uplift with art". And she does it so wonderfully. Petra also loves to work with plaster and wax, find out what inspires her! Laly: Petra, your art is so airy and uplifting, so full of light. Can you tell me a little bit about your process, in particular how you choose your colors and how you infuse light into your work? Petra: I really live my life focusing on Lightness. One of my favourite mantras is “What you put your attention on grows” and I really live by that. Where do I want to put my attention? On lightness and what really brings me joy. I want that to grow in my life as well as others lives. I want my art to give light into the space that it hangs and when I teach I hope to bring that light into my classroom! I am a busy mother of 4 small children and creating means a whole lot to me but I do not have hours and hours every day to create like I would love to have! So, I have created a way for me to dive into my joy whenever the opportunity strikes!! One day when all of my children are in school I look forward to spending my days taking online classes, creating new art and just enjoying the silence ;) But, for now it is 10mins here, 30 mins there. My process really allows me to walk into the room to add a layer when the opportunity strikes and I end up with something beautiful to me in the end. It’s funny, I am really drawn to bright colours when I am looking at other art but really what comes through me are lighter colours like a light teal, creams, grey, pink and yellow. My art is all about the energy that is infused into each piece and the energy I want to put into it is light. I want Light to just pour out and shift the energy of the space it is hanging in. Laly: I know how much you enjoy working with plaster and wax. Can you tell me what you love most about them? What does working with these materials feel like? Petra: I really love working with wax and plaster! I was drawn to plaster first and I loved the texture it gave to my pieces. The texture was something I couldn’t achieve with the mediums I was used to working with (paint and paper). I love getting my hands into the plaster while applying it… I love the creamy texture and I enjoy how I can manipulate it to give the effect I am going for. If I want lots of texture I can add it in but if I want a smooth finish then I can smooth it out or sand it down. Wax is a newer medium for me but the moodiness it gives has really attracted me! It is actually kind of addictive! I am still learning but using wax is something that I will be doing for a long time to come. I love running my hands over pieces I have made with plaster and wax… there is something so tactile and dreamy about it!! Laly: You also have a talent for photographing your natural surroundings, and in particular capturing the softness of light. Can you tell me about that recent outing on a misty morning? What did it feel like? What did you love most about it? Petra: I really enjoy taking photos of nature. I have been doing that for years now and it is another way for me to go into my joy for a while. Generally I love getting really close up to small flowers that seem like they just fade into the background. I love to shed some light on those little, powerful and full of life flowers! The other morning it was around 5am and I was cozy in my bed… the house was silent. It was glorious! But, then I looked outside and there was this incredible foggy mist that was hovering so beautifully. I just HAD to go out and photograph this magical morning so I ran outside with my camera…..still in my pyjamas may I add and I drove around my small town taking photos of trees, donkeys and the sun rising. It really was magical. The light of that morning was something out of a movie and the town was just waking up so it was very still. I am so happy that I chose to run outside that morning!! Petra: This is a really great question that has me really thinking! I have two favorite seasons… Spring and Fall. I love when the air changes in Spring and all things “wake up”. The light starts to last a little longer and the air is fresh…I really become alive again after winter in which I tend to really go inward and hibernate. I love going outside again and seeing all the plants start to bud. Really, it is such a wonderful time of year for me because I am blooming again just like the flowers, trees, bushes…..
Also, I love the Fall. Again, for me it is all about the air and the light. The air changes once again and it becomes crisp and fresh. The light starts to become more golden and orange as everything starts to prepare for the winter. I love taking walks and just being out in nature enjoying changes of leaves. My favorite time of day is when the sun is setting or rising. It isn’t very often when I am able to enjoy the sun when it is rising but it really uplifts me energetically to be there when the sun starts to rise. I feel the same way about when the sun sets but in a more calming way. When the sun rises I feel very invigorated but when it sets I am very calm. This time of year (spring/summer) around here is glorious… the air smells of fresh cut grass and smoke from people having fires in their yards!! Petra Hrziwnatzki is a mixed media artist, teacher and busy mom. She lives near Ottawa in Ontario, Canada where she creates dreamy and uplifting art inspired by her natural surroundings. Find out more on her website and in this beautiful video! Connect with her on Facebook. Roxanne Evans Stout and I met online a few months after I created this course, and we just couldn't believe that our paths hadn't crossed before! There is so much in common between the ways we approach art, inspiration and creativity. 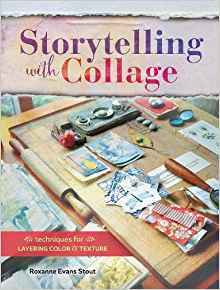 I first found out about Roxanne through her beautiful book "Storytelling with collage" and instantly knew I had to contact her! Laly: Your art is so layered, textured and at the same time delicate. In Layers of Light we're paying attention to the way light plays with texture and gives our work a unique tactile quality. Can you tell us a little more about your layering process? What kind of textures / materials do you feel most attracted to? The textures and materials that I am very drawn to for collaging and layering are thin papers like tissue and rice papers. I also love Mulberry paper and papers from Nepal. These papers let plenty of light in and can add a luminous quality to a work of art. My layering process begins very intuitively… I love to play with arrangements of images and textured papers. After I have a played for awhile and have a design laid out I begin adhering my papers with Matte Medium. During this time I often change my mind in my placement. I love that freedom collaging offers. 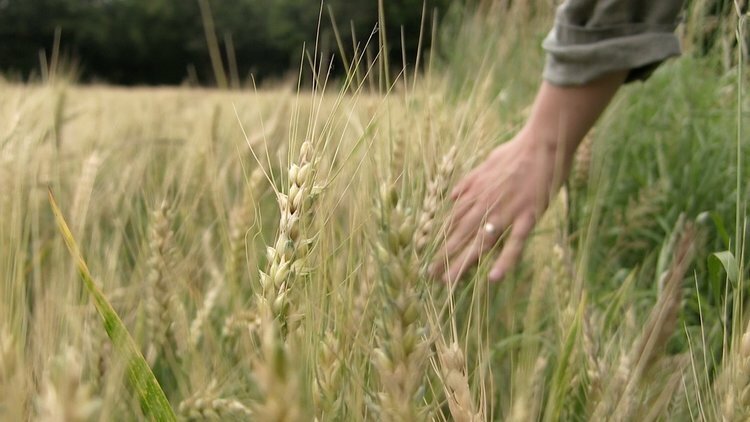 How do nature and your surroundings, inspire you? What do you love about working with natural materials? Nature and my surroundings mean everything to me. I feel a very spiritual connection to nature. It is when I am outside in our gardens that I am truly at peace and have a feeling that I belong on this earth, just as the birds and trees and the flowers belong. When I go outside (and I’m not gardening), I love to write in small notepads or journals. We live in an area with very little traffic and the sounds of nature are everywhere. The birdsongs, the whispering pines and the rustling maples all surround me. During these moments I feel that the words just pour out of me, and these words inspire me later, especially in the cold white winter. Nature teaches me — she gives me quiet. She gives me hope and guidance. Natural elements play an important role in many of my projects, especially when I am working in a book. 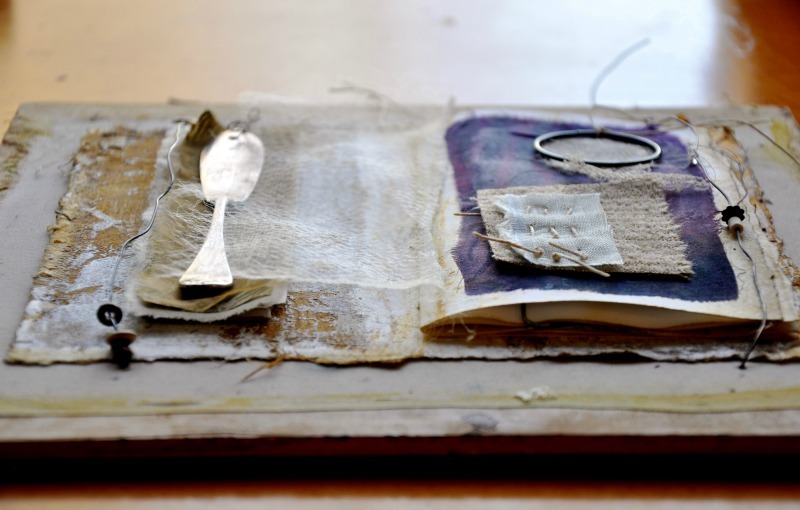 I love the book arts and making books that are filled with surprises and treasures from nature. A flat stone, a pressed leaf or flower, dried grass, a feather or a shell can often be found on one of my pages. Oh, I love all kinds of light! I recently moved into a new studio, an extra bedroom in our house, and the light comes in so beautifully from the west in the late afternoons. I also have a sunroom across the hall which inspires me because of the eastern, morning light and a view of the Klamath River. This room used to be my studio and is still an inspiration, just not as messy! I think that my favorite light is filtered, tinted yellow or blue as it dances through our maple trees and plays on our red brick patio. I also love the light outside when a storm is approaching, and the suns rays pour across the sky through the clouds, to me this is almost like you can see heaven. The third light that I love is the meadow light that streaks over the fields, and across the river in the evenings in the summer… this is particularly beautiful and sometimes is followed by a rainbow. I don’t know what this says about me… maybe that I love light that is surprising, different and moving, natural light. I love to photograph my work in natural light too, or light that is filtered by the trees. "In what ways does this echo my own inner light?” What a beautifully worded question Laly! The light that I see is there for those who take the time to notice. My light is the same. Through your art and through teaching, you shine a light for others so that they can find and express their own creative spark. Can you share some personal practices that help you keep your own light bright? I have said this before, but was just saying to the lovely participants in my last workshop that my “job” as a teacher was to help them find their own light. Sometimes we all need someone to help us see our own light. I keep my own light bright by making art, when I am working alone and in a creative meditative state when time seems to flow like a song. And also when I am around other people who love to create. Roxanne Evans Stout: I live and create in the beautiful Pacific Northwest and the mountains and the river lands that surround my home are my constant inspiration. I am an Adjunct Professor at Oregon Institute of Technology where I teach Mixed Media Arts. I share my art in workshops throughout the United States and have had my work shown and been published internationally. I also teach online workshops to students who are from all over the world. Teaching enables me to share my passion...nothing makes me more happy than helping my students through their own process of renewal. My goal is to help you find your own magic. Through my art I would like to convey the feeling of connecting, timelessness and re-creation. As an artist I am constantly learning and growing. Art is my passion, my love, my soul. Stephanie Lee is one of my absolute favorite artists. Her art and spirit have truly inspired me to grow and experiment, especially in my very first years on the creative path. Stephanie works with plaster, wax, metal... She also has the most beautiful way with words and I know she'll inspire you! Laly: Your art has such a unique, soothing quality. To me your paintings seem to radiate a soft, warm, natural light. Can you tell me a little bit about your process, in particular how you infuse light into your work with plaster and wax? Stephanie: Almost all of my paintings begin with a layer of plaster. Sometimes the layer is thick, sometimes it’s a paper thin layer coating the surface of the substrate. The meditative process of refining the texture of the plaster very intentionally or honing it to a smooth surface immediately calms any sense of concern that I don’t know where to take the painting next. No color exists in the piece yet but still there feels like a sense of place, an invitation to respond with what impulse comes next. The natural minerals in the plaster receive and reflect the light in a subtle, soft way that is so different from equally white paper or gessoed canvas. 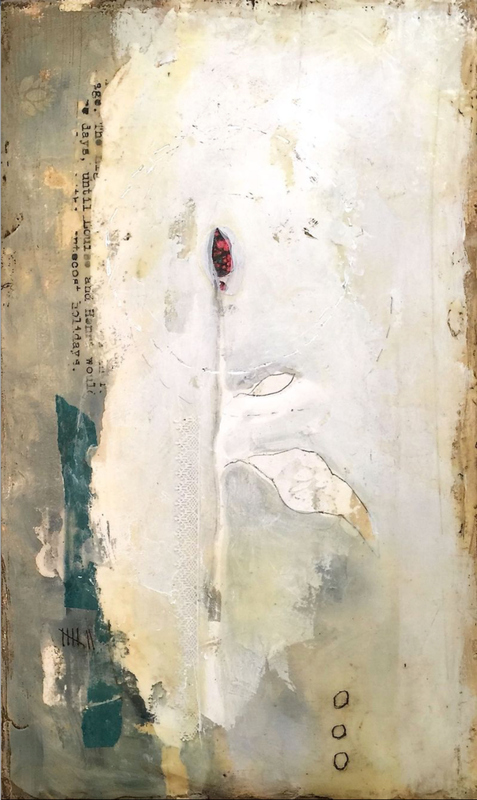 As the layers of paint are added and removed, papers attached and scraped back, marks gouged into the plaster as thin, delicate lines or as deep crevices, the surface is then ready for the last layers of encaustic medium. Sometimes I will use bits of opaque encaustic paint to serve as a sturdy space holder but most often I cover most or all of the painting with a layer of clear encaustic medium. The luminosity that the encaustic medium gives it is like no other product I’ve found. 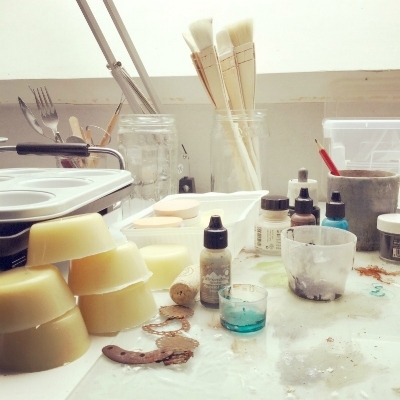 Over time, the waxy surface takes on a very matte sheen which prevents too much ambient light from bouncing around on the surface of the encaustic medium. I prefer this matte-to-flat finish even though many encaustic artists buff their wax out to a high gloss sheen. The matte finish allows the light to penetrate deep into the surface of the painting allowing all the luminous layers to shine through in their own subtle and synergistic way. Laly: How does nature, and your surroundings, inspire you? What do you love about working with natural materials? Stephanie: I love a well worn river stone or felled wood that has been beat on by rain and winds for season after season. I am inspired to bring that sense of history and wear into my paintings through the use of plaster and using my tools in such a way that somewhat replicates the wearing down of things that happens in nature. Plaster, as a natural material, has inherent in it a simplicity that allows for so many other types of things to join with it. Like the layers of duff on the forest floor, layers of mediums are added to my paintings - some remaining in plain view, others completely immersed to only offer an energy of presence that can only be felt and not seen. I know of no where else than in nature where the buried, invisible layers actually create more richness to the surface and I experience that same feeling when building up layers in my paintings. Stephanie: My favorite kind of light is the one I’m experiencing and fully aware of in any given moment. :) I am particularly fond of that cool blue-black dawn light that appears before the golden hue of the sun takes over. And then the light at dusk - the low, long shadows that turn everything warm and golden. I must say that my favorite light - the light that captures my attention the most - is that unique glowing light that gets trapped under the thick and low light of a drenching summer rainstorm. It often has a reddish glow to it and is reflected on every smooth surface in sight and somehow makes gray seem like the most inviting light in the world. I’ve long since known that my favorite kind of light (or weather, for that matter) is the one that is changing into another. When I can walk outside and see irrefutable evidence that spring is giving way to summer and night is giving way to day. The changing of the light is what captivates me the most. It is true for my own inner light as well. To feel myself changing and growing into the next version of myself and how I want to experience and share my light in the world. I am often a mystery to myself as I don’t always know what the light inside me is changing into and so i have learned to observe, remain open, and to be willing to listen very closely for how I am supposed to share that light with others. Laly: Through your art and through teaching, you shine a light for other artists to find and express their own spark. If you could speak to the wild, shiny creative child who lives inside each of us, what would you say? Stephanie: I would say that it’s okay to not see the whole path before you. All you need is enough light for the next step and when it feels like there isn’t enough for even that, feel your way through. The light is not just from within or just from outside you. It is both. It is a dynamic pulse between you and all of creation and you are invited to join in the dance of creation being continued. On days when it feels like your light is all but snuffed out, take what little you have and light another's light with it. You’ll notice that in the meeting of your two flames, there is a flash of light even brighter than your light was before. This is the light telling you “Yes! Look at who I am when shared! Wild and bright and bold!” Light changes and morphs and shifts with the seasons of your life as well and so trust that the light that lives in you is more than enough to keep seeing deeper into your own being. But don’t keep it all to yourself. Let it shine and burn through the old stories and lay a path for new, kinder ways of being. Hi. I’m Stephanie Lee. I am the “workaround warrior”. I write, paint, and push around all sorts of materials to create real-life art from the pictures in my head. I don’t waste energy breaking the rules just for the sake of rebelling. I also don’t waste time trying to know and follow all the rules. Instead, I find the workaround. My curiosity is too directed in finding a way around the rules/the schedule/the challenges than to get caught up in limitations. I examine the dead ends and break-throughs of my own artist + hero’s journey to help others find their own creative sweet spot and workaround flow. As an artist and instructor, I travel the world to teach in person and also plant flags on the internet to teach art online to daring creatives. The alchemy of this collaboration ignites the bright light of desire in the hearts of the participants to connect more deeply with their own unique, inherent creativity. I mentor privately with women who want to live up to their divine potential, connect with creative clarity, and master the navigation of their busy lives to feel deep satisfaction with how they honor their time and life energy. Jessica Leigh Brogan loves to capture the beauty fo life in many forms: photography, mixed media art and above all, words. She is passionate about creating community and helping creatives (like me!) own their gifts and share them with the world. Jessica is also a mom of two and teaches French (and so much more) to lucky US high-school kids. Laly: Jessica, I know you are passionate about traveling and photography. You capture light, color and beauty around the world as well as in your daily surroundings. What does the light look like, and feel like, in your favorite places? Jessica: It's interesting, Laly, as I was looking through some of my favorite photos for this interview, I recognized that in certain photos, the light I captured actually transported me back to that place, to that moment. Such is the power of photography. The lights that I gravitate to actually appear in my favorite places in the world, not uncoincidentally. I find myself moved on a soul level by two types of light. First, the baked warm rays of the Mediterranean. Most specifically, I've spent much time in Italy, even having lived there once. Each time I visit, I find myself removing items from my "must see" list and instead picking up my camera and literally stalking color and light around one corner after another. The light is unjustly beautiful in the Mediterranean, where those ancient stone buildings reflect and mimic the orange and red tones of the evening sunlight. There's history, in the light there. As we know, the cradle of the Mediterranean is responsible for so much of the artistic, musical and creative modern world. As I spend time there, between the colors of the buildings, the colors of the languages, and the light that seems to emanate from the land itself, I feel I'm absorbing some of that creative spirit. The light of the tropics also feels like home to me. There is nothing quite as soul moving as stepping off the plane each time I visit Hawaii; the light there is so bold, so clear, I feel cleansed and emboldened with the spirit of possibility. It's not the same kind of light at all. And it's not a light I have ever encountered elsewhere. Again, the landscape, the lush bold flowers, the deep greens of the mountains, it all makes sadness a distant memory. Laly: Deep in your soul, I know that you are first and foremost a writer. What does your creative process look like? How does writing allow you to express your truth, your inner light? What does it feel like when you don't write / can't write. How do you get unstuck and rekindle your creative spark? Jessica: I believe that every person has a natural gesture, a form of creativity that was given by source, that is their strongest form of self and potential. For me, that is writing. Plain and simply, when I write, I feel an absolute conviction that I am meant to write. It feels like a fact. When we find THE gesture of creativity that is meant for us, it will feel this way. It can be other gestures for other people, and sometimes it takes some searching and experimenting to find it, but when you do, it will feel the way I feel when I write: like the most real and important version of myself is in operation. Like everything is safe. Like I can trust source undoubtedly. Like nothing else matters for the moment. Writing took a back burner for a couple of years in my life, specifically while I was a single mother and also attempting to build up a creative business (and feed us). There was a time where my blog (which I've had since 2005) didn't "make sense" all of the sudden. I wasn't traveling the world all of the sudden. I wasn't documenting or reporting on life abroad. A lot of things were changing, and at the same time, I was drinking the koolaid of "branding" and building a website and blah blah blah. I couldn't figure out how my writing, which is often reflective, had anything to do with the creative offerings I put out. Well, it turns out that not writing has a noticeably negative effect on my life. I burnt out trying to build a business that didn't make room for my deepest soul expression. I felt lost and confused, and most of all, terribly distant from that soul calming space that I access when writing. It really is, when we find out soul's creative gesture, a place of most serene calm and nothing else can replicate it. When I don't write, I don't have that calm. I don't feel the same connection to the Universe. I panic more about life. I flounder. We live in a world where we often feel the need to "justify" our creative actions. So many of us are under family or partner pressure to sell our creative works to justify making them, or spending the money on supplies. I know this. And I've realized that this has to be fought back against. I can't justify my writing time on an external level, the way our culture works. But so what. I can and do justify it because it is my sanity, my comfort, and frankly, my friend. That should be enough; that should be plenty. In fact, it is everything. To get back to my creativity, for anyone who has felt stuck and wants to rekindle (as many of the women who message me often say), I recommend just starting somewhere. When we haven't been creating, it feels overwhelming to start again. If we're going to do something, we suddenly feel like we have to do the "right thing." Too much white space, literally and figuratively. You don't need to worry about this. Start with what matters, which is getting your hands moving. For me, instead of drowning my enthusiasm with thoughts of writing a book - too big! too wide! - instead I slip into a bath, the only place I get some privacy, and I pull out my phone and I ask myself to write something. Just something. The time is short, the environment warm and cozy, and the only thing that matters is that I did something. When I need to tap into my other creative sides, a simple photograph in the garden is enough. Ten minutes, yes just ten minutes, at my art table, is enough. One day, maybe I'll get that canvas series out. One day, maybe you'll get that fiction novel out. But while that's not happening, we need to get the hands moving, and tap into the source. Ten minutes will make a world of a difference in your mind and body. Try it. Laly: You are also a teacher and a circle maker. You have a talent for holding space and creating community, so that others can shine their own light and share their gifts with the world. In today's world, we rarely gather around the fire anymore. How important is it to keep telling our stories? Jessica: It is so important, because as long as we keep our stories to ourselves, we slip into the easy belief that no one else has made the mistakes we've made, or had it as bad. In short, we isolate. Isolation of experience is truly a crisis. It is something I could devote my life to - dismantling isolation of experience. I do this in my high school classrooms everyday, and it's one of my main missions in any offering or circle I create. To illuminate for people how very much we have in common. When we learn the other ways people struggle, it has the most amazing, and odd, ability to make our own struggles a little easier to bare. There is REAL power in sharing our stories, and our vulnerable true selves. Whenever I get an email where someone is writing about one of my offerings and then suddenly slips into spilling out their entire, vulnerable story, I sit down and reread it two or three times. I have to. It's such an honor. And instead of this person being a first and last name that signed up for my course, they are now a full person to me, with these WOW stories. We all carry so much. SO MUCH. We never know what the others around us are carrying, do we? Not unless we share these stories. Yes, it's vulnerable. But the reward is that we instantly feel less alone. Isolation in our stories is a really negative force on our lives and happiness. I am always surprised when people hoard their stories. Even their hardest, ugliest ones. I know why they do - fear. But I wish I could impart to people that hoarding and secreting these stories is really damaging. It keeps us isolated and it keeps someone else from finding solace, even healing, in the discovery of your story. Jessica: The early morning light is pure gold. Often, literally. But it's also such a quiet, open light. It's a light of peace, and calm. Mid-afternoon light is a light of joy and ripeness. It is pure saturation of self, and possibility. Evening light, the sun setting and he world sighing off the day's weight, it gives me a sense of trust in the cycle of things, in the ability to hold what we must hold. And then, the dark light of night. There is a gratitude in me for the lack of light, for the times to rest from all that we hold. It is what makes the day of light, and beauty, something we can truly cherish each day. My name is Jessica Leigh Brogan. I am a published artist and author. Tending to, and honoring my creative side is paramount to surviving this suburban life as a mother of two, and writing and art journaling help me keep my connection with my individual soul, and with a greater creative source. A nomadic, rebel soul, I'm addicted to traveling, equally so for the chance to commune with humanity, as to stalk new and breath-taking sights of beauty. I am also a French teacher attempting to turn these young American hearts here in Oklahoma to wider horizons and bigger possibilities. I create and hold circles online for women - safe and nurturing spaces to explore and grow our creative sides, in whichever manifestation calls to us. In this video series, I'm presenting my favorite supplies to play with whites, neutral tones and black. Look around you for all the things you could use to create a variety of whites, blacks, and all the subtle tones in-between. Don't be afraid to try unusual supplies and experiment with fun combinations, like white-out pen on teabags, bubble-wrap prints on tissues, coffee... Enjoy! 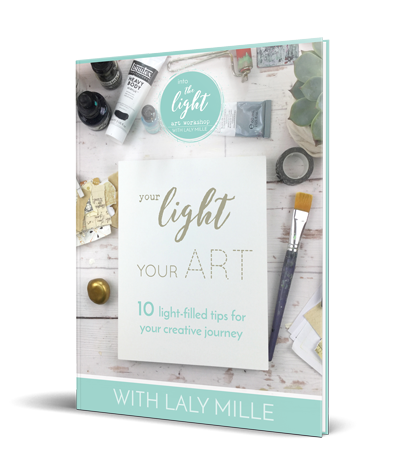 "Into the Light" was originally offered as a free, one-week workshop to celebrate the first anniversary of Layers of Light! It is a bit like a condensed version of the class and can be both a great intro, or a great refresher if you've been here for a while. I'm delighted to offer it to you here as a free bonus. Enjoy! 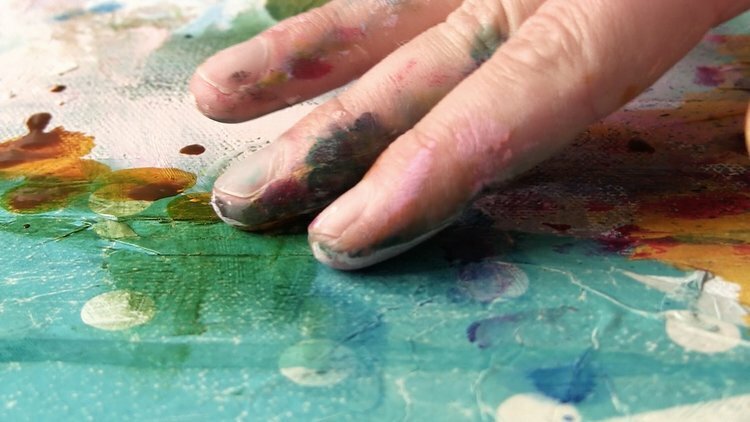 4 Steps to AWAKEN YOUR CREATIVE SPARK! 3. Share your ahas in our group! ... and let's make some art! 4. Share your art and journey in our group! 1. Visual meditation: connect to your light & invite inspiration! 3. Build up the layers! 3. Share a comment in our group! Are you sometimes afraid to approach the blank canvas? Does it feel a little scary? A lot maybe? Do you love to create but keep finding excuses to do a hundred other things instead? Or do you dive right in but then stop in your tracks and end up judging your work, and yourself, harshly? Do you sometimes hear nasty little voices telling you that you're not good enough or that you can't even draw a straight line, so why bother? When it comes to art-making, I have learned to keep these nasty little gremlins in check most of the time, but what about the other things I want to create? Like this very class for instance: it is probably the scariest, most vulnerable step I have taken on my creative path so far. 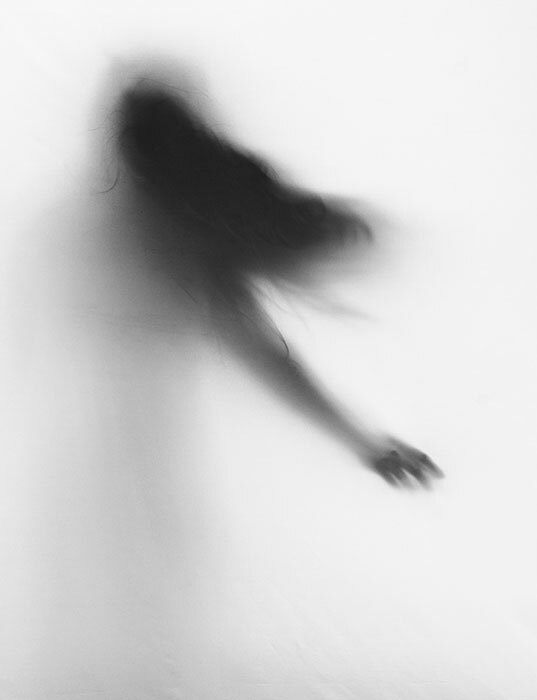 And believe me, I've tried to hide and run away from the whispers of my soul. Just like with art-making, it's been quite a journey before I finally let go of the resistance. Ah, resistance... we all have it! We all have an inner critic, and fear… because we all have a left brain! (and it’s OK) Our left brain is really not our enemy at all. Its job is not to drive us mad or paralyze us with its arsenal of you’re-not-good-enough, who-do-you-think-you-are and just-check-your-emails-first strategies. Its job is to protect us. That’s why it doesn’t like it when we try something new. To our left brain, change = danger! Going out of our comfort zone = jumping off a cliff. This workshop is a place for you to experiment. There is absolutely nothing at stake and mistakes don’t even exist: it’s safe. Taking a walk, breathing some fresh air, paying attention to the sounds of the birds, of the wind, or simply getting lost in the patterns of a leaf, a flower... Paying attention to the texture of a pebble, to the way light and shadow play in the leaves... 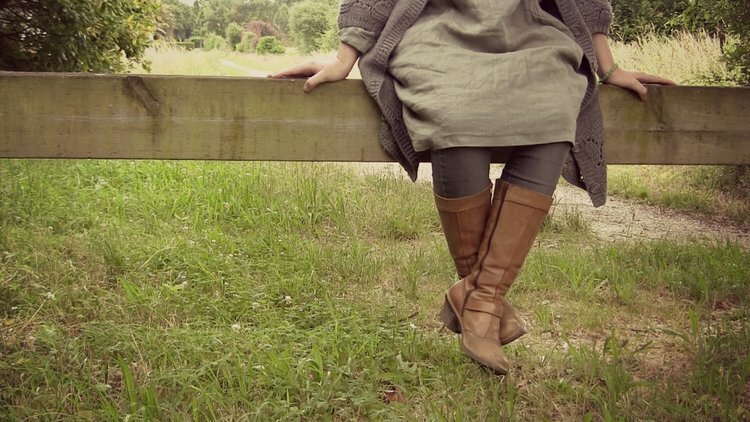 These are all great ways to quiet the mind while gathering treasures of inspiration! The left brain thinks in words, so why not give it a place to say what it has to say? A few pages of "brain dump", like Julia Cameron’s "morning pages", can work wonders. But even better, you can incorporate words directly into your art. It's a gentle but powerful way to invite your left brain to play and to create from a place of wholeness. I do it all the time and we are going to do it together in the projects of this class. Trust your own rhythm, your creative heartbeat... You have all the time you need, and there is no such thing as falling behind (but make sure you don’t fall into the trap of procrastination either!). You are on a journey of discovery... Maybe you have been for a while, or maybe you're only just beginning... Wherever you are, trust that you're exactly where you're supposed to be, in your own divine timing! This class is meant to be a deep, quiet, self-paced offering. You have plenty of time to move from one step to the next: take this time to fill your well, to feed your soul... Slowing down is good! The soul-work, the journaling, the wandering and gathering... are a vital part of this creative process. That's where the deepest part of the work happens. There is no way anyone in this class can "fall behind" because the whole point is to pause and take the time to truly be with your light, with yourself. This time is nourishment and will teach you more than I ever could, because you will learn from your own inner artist. Above all, treat your inner critic with love and compassion. Listen to what she/he has to say, but then... do your thing anyway! It’s just a normal part of who we are as human beings, it’s part of our survival instincts and most of the time, our inner critic just wants to help. With patience you will learn to let go and you'll be able to create more and more freely. The important thing is to get started, now, and not look back. Here is a conversation from our Circle of Light Facebook group that many of you have found useful and uplifiting, so I'm adding it here! "Am I alone in feeling quite intimidated now, having seen so many wonderful posts and images shared from those who are already journeying along their paths? I have at least begun sorting through images (and combined this early task with some very essential de-cluttering - one less pile of magazines!) - but I don't know how to put aside all the lovely images I now have floating around in my head from this group, to try and find my own voice?" The next thing I want to tell you is that I get those exact same doubts and feelings. All. The. Time. It's completely normal and it happens to all artists. In fact, being scared of making work that's too similar to someone else's, shows how deep your desire is to express you own authentic truth, to speak in your own unique voice. Your light has such a strong desire to shine through your art that the moment you let it out, it will amaze you! But just like all artists, and all human beings for that matter, you have a right brain and a left brain: your love-connection-wholeness-based intuitive mind, and your fear-doubt-individuality-based analytical mind. The first one rejoices in the here and now, the second is projecting its fears into a future that doesn't even exist, because you haven't started yet... This is NORMAL, and both parts are useful in the creative process. But right now one is speaking a bit too loud, preventing you from starting, from having fun and opening up to the unexpected, to the potential of your unique creativity. So there is only one thing to do... go create something! You could start by exploring the "Natural Palette" videos in the resources section and just playing with your supplies. Then maybe do the mini collage exercise from chapter 1 first, as it is designed precisely to put your left and right brain in sync. Then you'll realize you have started, you are creating!Also, write, write, write... And then on to the soulboard… I know many have posted beautiful images of these first projects in our group, but the point of these is not to create works of art. It's about the journey much more than the result (trust me, if it were, there would not be a horse on my soulboard!). One last thing: it’s much more difficult to copy than to come up with your own stuff! People who really copy are able to do so because they are intentional about it. But if your intention is to create your own authentic art, then it would be really hard to end up with copycat work… That being said, for many people the learning process requires copying. That’s just an extra, reassuring step towards developing their own style, and that’s completely OK too, as long as they’re clear that it’s not « their art » but simply an exercise. The key is to just do WHAT FEELS BEST to you, what brings you the most joy! We all have a patchwork of images in our heads from all the art we absorb. It reflects our tastes, what's aligned with who we are. It helps us define ourselves visually. But once you start creating, you eventually realize this is not where your art comes from. It's the context, not the source of your art. So no worries!" You will also find a ton of creativity tips in the Bonus Workshop "Into the Light". Join the tribe on Facebook and Instagram!